I made this for the anything goes Kraftin Kimmie challenge and the Seize the sketch #18 challenge. 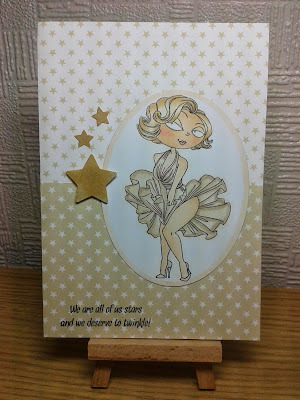 I used papers from Pink Petticoat (that I can't seem to find on their website right now) and Kraftin Kimmie stamp Marilyn (again, can't find on her website!) Coloured with my limited supply of copics and I used my wink of stella glitter pen on the stars for the twinkle, but it doesn't show up too well in the photo. What a great sentiment! 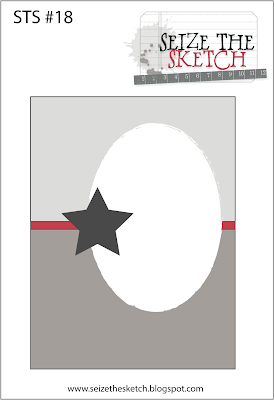 I just love this card with its monochromatic color palette. Lovely! Thanks so much for sharing with us at Seize the Sketch!